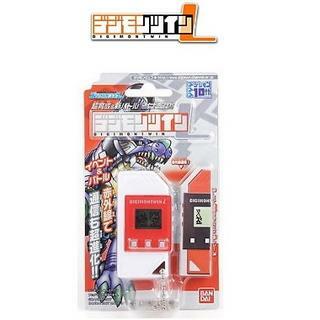 The Digimon Twin (デジモンツイン) is the eight series of the Digimon Virtual Pet produced by Bandai of Japan. The Twins are the first line of V-Pets to be offered in sets of two as a pair and to allow a friendlier communication system. Digimon Twin L (デジモンツインＬ), L stand for Liberation. This Digimon Twin is unique in that it was originally released in pairs. Another Digimon Twin R required to get the most out of the game. Nyaromon: 0-1 Calls. Must have been born from special event egg. This Digimon must have been born from the special event egg. Any Digimon: Weight above 80G. Burpmon cannot battle and will turn other Digimon into Burpmon during Event Communication. Burpmon will return to its previous form when its weight drops. There are three buttons on the Twin. The A button, the first one, is used to scroll between selections and bring up the menu. The B button, the second, is used to confirm selections. The C button, the third, is used to cancel selections. When held down on the main screen, the C button will also allow you to see the clock. Holding down C and pressing A allows you to turn the unit’s sound on and off. The Digimon Twin has a battery save function and can only be brought out of it by pressing B. Care: This icon looks like an exclamation point. Selecting it will bring up whichever care option your Digimon needs. Most of the time, it gives you the option to feed your Digimon, but it also handles flushing, turning the lights on and off, and giving medicine. Training: The next menu screen displays a barbell icon and a book icon. Select the barbell to train your Digimon by rapidly pressing the B button. Select the book to view your Digimon’s battle records. Connect: Here, you’re given two options: Twin and D-Vice. The Twin option gives you the option to battle another Twin or connect for an instance of Event Communication. The D-Vice option only allows you to connect with an iC or Burst. This will not be a true battle–the iC or Burst will always register a win, and the Twin will get the Bomb item. Stats: This icon looks like a heart. Here, you can view your Digimon’s Age, Weight, Hunger, and Strength. The Hunger and Strength gauges will flash between a piece of meat (or vitamin) and a stack of four indicators that function much like the hearts in older v-pets. Event Communication is the main gimmick of the Twins; you can watch your Digimon training and eating side by side. Event Communication will give one of the following outcomes, listed in order of frequency: eating, training, receipt of an item, special event egg. If two Twins of the same version (two Ls or two Rs) link for Event Communication, both units will receive the Banana item, making it impossible to raise certain Digimon without one of each unit, as some Digimon require the Bomb item or the special event egg. Meat Decreases Hunger by one. Protein Increases Strength by one. Apple Decreases Hunger a little bit. Banana Increases Strength, makes Digimon slip and fall. Bomb Decreases weight to minimum and empties Hunger meter by half.